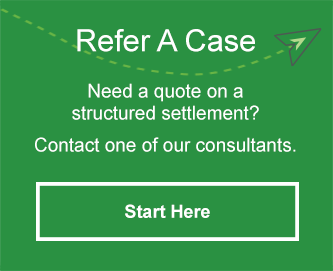 If the plaintiff wants to cash out of the settlement, can the attorney structure his or her portion of the settlement? Yes, an attorney can structure a fee on a standalone basis if the plaintiff does not want to participate in a structured settlement for herself or himself. Can the payment stream of the plaintiff attorney be independent of the payment stream received by the plaintiff? Yes, the streams can be completely independent. The timing and amount of payments do not have to correspond with those of the plaintiff. Is a structured attorney fee still viable if the fee must be split among multiple plaintiff attorneys? Yes, it is permissible for plaintiff attorneys to have a separate payment schedules. Furthermore, not every attorney has to structure his or her portion. Is it possible to designate a beneficiary for future payments in the event of a premature demise? 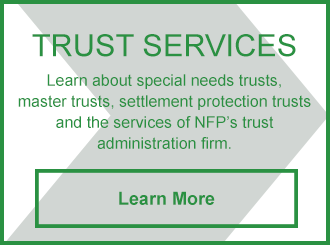 Yes, a structured fee can pay a beneficiary on a tax-deferred basis. It is important to thoroughly discuss the beneficiary designation prior to concluding the structured fee because many life companies will not allow changes in beneficiaries in the future. For this reason, the estate of the attorney should be considered as the beneficiary. Does the structured fee go to the individual attorney or to the law firm? How is the firm incorporated? Is it a C-corporation, S-corporation, LLC or partnership? Is there an employment agreement in place between the various members within the firm? Furthermore, is there a plan in place in the event of a dissolution of the law firm? From a tax standpoint, is it better to pay the fee to the firm or the individual attorney? If the fee is paid to the firm, how does this affect the beneficiary designation? The consultants at NFP Structured Settlements will work with you to ensure the successful coordination of the above items. Does the initial contingency fee agreement matter when structuring a fee? Yes. Ideally, the contingency fee agreement with the client specifies that the plaintiff attorney can accept all or a portion of fees earned in the form of periodic payments. It is recommended to include this provision in every fee agreement. If it is not in the existing contract, it is a still a good idea to amend the fee agreement, even if that amendment occurs simultaneous to the settlement. When structuring an attorney fee, are the same rates utilized for both the attorney and the plaintiff? For the most part, the same rates are applicable for both the plaintiff attorney and plaintiff. If the attorney has a medical condition impacting his or her life expectancy, it is possible to secure rated age underwriting. What are the documents necessary to set up a structured fee? Who owns the structured fee contract? An attorney cannot own the contract. The assignment company must be the owner, even though the plaintiff attorney is the recipient of all the payments. This ensures that the attorney is not in constructive receipt, which would make the payment immediately taxable. Can the payments be accelerated? All the documents (including the annuity contract, the settlement agreement, the fee agreement, etc.) should clearly indicate that the plaintiff attorney has no right to accelerate any of the payments. This also avoids any argument that the attorney had constructive receipt of the funds. When can a plaintiff attorney structure a fee? When is it too late? An attorney must agree to a structured fee prior to the case being resolved. This means that before a client signs documents and checks are issued, an attorney fee structure must be in place.